Crested geckos are one of very few reptile species that thrive in virtually the same temperature range that humans also find comfortable. Crested geckos are best maintained at room temperature. Fluctuating temperatures of 72-80F are preferred, although they can withstand night time temperature drops into the 50's. At temperatures above 80-82F, smaller crested geckos will start to lose their appetite, become stressed and their overall health will decline. Exposure to temperatures above 85F for even a few hours can be lethal for crested geckos, especially hatchlings. At extremely high temperatures, they may begin to exhibit neurological symptoms (drop their tails, etc.) and death can occur rather quickly. If I could pick one ideal temperature, I would say 78 to 80F, depending on age, with freshly hatched babies being kept around 72-75F. Crested geckos can live 20 years or more, and there's a very high probability that your gecko will live a full, happy life if you just keep it fed, watered and cool. These geckos just don't normally have health problems that happen occasionally with other geckos. That being said, they will most likely DIE - and sometimes in a hurry - if you overheat them. Crested geckos do best in the high 70's or low 80's, but nothing warmer than 82F. If you provide your crested gecko cage with a light bulb (night bulb or day), be sure to NEVER use a bulb over 15 watts on a smaller cage (up to 18x18x18) or 25 watts on a larger cage (18x18x18 or larger). If using any sort of lighting or heating device, it is imperative that you monitor temperatures and not allow them to get over 82F. These geckos are almost impossible to kill, but they WILL NOT fare well if you overheat them. This is especially the case for new hatchlings up to 3-4 grams. Humidity isn't a huge issue with crested geckos, but a lack of humidity and/or hydration can cause shedding difficulty. We generally like to keep the humidity around or slightly above 50%. This is very easy to maintain in most homes by a quick misting or two every day when the furnace or air conditioner are running. Low humidity will usually result in a gecko not being able to stick to smooth surfaces. For years I misted my geckos to keep the air humid enough in the winter. With the furnace or space heaters running, humidity will dip to 10-20% if it gets really cold outside. To combat this, we started providing our younger geckos with a "humid hide", which is basically a smaller version of the nest box that we give to breeding adults. Over the years, I noticed that adults didn't seem to have shedding problems nearly as often. I also noticed that males would spend some time digging around in the nest box, so it got me thinking. I now provide all geckos with a 6.75" round deli container that measures about 4.5" tall. This is in a 20 quart container. Remember...the larger the cage, the larger the humid hide will need to be. We fill this container with our coconut and sphagnum peat moss mixture (1:1 parts coco fiber and peat moss) to within an inch of the top. Sphagnum moss works great too, but I'm doing larger numbers and cost is a concern for us. Then, instead of a lid, we place a piece of artificial foliage on the top to slow the evaporation process and give geckos a place to hide. I've never had much luck getting cresteds to drink from a bowl when they're babies, so we spray our younger geckos to give them drinking water, as well as provide a water bowl so they can get used to finding water to drink. With older geckos, they're already drinking from a bowl, so we just provide a water bowl and if the humidity is decent, we don't need to mist the cages (except to keep the nest box damp for females to lay their eggs). The first sign of minor dehydration is wrinkled skin. In severe cases, the head and eyes will start to sink in and the geckos themselves will have trouble moving. If your gecko becomes dehydrated, just fix the issue - mist the cage, provide a more accessible water bowl, etc. If this doesn't appear to remedy the dehydration, an overnight soak in shallow water (just enough to keep the gecko's belly in contact with the water) should give the gecko time to drink and for its skin to absorb some moisture. 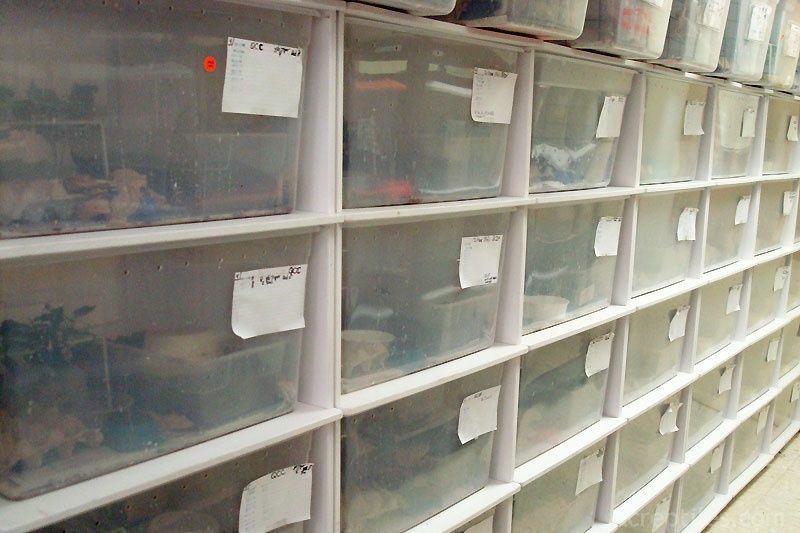 Crested geckos can be maintained successfully in just about any type of caging setup. Being a python guy all my adult life, I naturally took to using a plastic tote, rather than an actual cage. Totes are light weight, durable, inexpensive and most importantly, they're effective - meaning animals really tend to do well in them. 1. Crested geckos are arboreal, so we generally like something with ample height for climbing, but not too tall. Our tubs are roughly 12-13" high for breeders and 5-7" high for babies. A lot of people use taller cages, but the more air volume in the cage, the harder it is to maintain optimal humidity. 2. A short, tight hiding place on the cage floor for when they're at rest is important. Your geckos will spend more time resting/hiding than they will climbing and jumping. Being reptiles that are hard-wired to hide from predators, they don't want a large area, but instead they want a short, tight hiding spot that they can wedge themselves into. This is basically so that anything large enough to be a potential predator simply won't fit inside. That's nature's way of staying safe while you sleep! 3. Lots of climbing structures. We like to use artificial foliage to better mimic the branches they rest on in their natural habitat. The leaves collect a lot of water droplets when we mist, and this helps provide additional drinking water, as well as giving the geckos added security. 4. The "Humid Hide". This is something that is mandatory for geckos of all ages, at least in my opinion. A humid hide is any enclosed area, like a deli cup, filled with a moist substrate. If set up properly, you won't have to add water to the substrate very often because it's a fairly enclosed space and the water will evaporate slowly. The key here is to use a substrate that is naturally mold resistant - paper towel will grow mold/mildew very quickly. We use a coconut fiber and peet mixture with a touch of play sand added, but natural sphagnum moss works well and looks great too. A deli cup, like you see reptiles shipped in, with a hole cut in the lid is perfect for crested geckos. The idea is to fill the nest box or humid hide as full as you can, while still leaving just enough room for the gecko to curl up inside. The more substrate you have in the tub, the more water you can have in the tub. The more water and the less air volume in the tub, the slower the water will evaporate. Provided your geckos are on a balanced diet, a humid hide will almost always put an end to geckos having bad sheds. 5. We provide all geckos with a food dish and a water dish at all times. Shallow and wide is good, but disposable souffle cups or salsa cups are also great too. Lighting - Read this before you buy anything! Crested geckos are nocturnal and from a forest habitat, so adding lights is not necessary, nor is it even recommended. In the wild, crested geckos retreat to a dark hiding place during daylight hours...this is not going to change in your home. Our geckos do great with just the ambient light in the room. If you would like to light your gecko's enclosure, be sure that the light bulb doesn't make the cage temperature too warm. If your room stays in the low 70's, I would recommend a 15 watt bulb left on 12 hours a day. If the cage is larger than 18x18x18, you could use a 25 watt bulb, but that's not really necessary. Contrary to what the guy at the pet store tells you, UVB light is NOT necessary and not even recommended. Remember, crested geckos are nocturnal and they prefer to squeeze into a DARK hiding spot during the day.· Light coming into the room through a window is actually just about perfect for simulating the amount of light that would penetrate the dense foliage of the forests that crested geckos inhabit in the wild. My geckos are typically fed 2-3 times per week. The typical regimen is Pangea PFM (the ONLY commercially available gecko diet we recommend) 1-2 times per week and calcium-dusted crickets 1-2 times per week. These days, we typically feed no more than 3 times per week...any more than that and your geckos will having you throwing away more food than they actually eat. What if my gecko's not eating? What if I need to leave town? There's another really nice benefit in keeping a gecko that thrives at cooler temperatures and doesn't eat very much in the first place. If you need to leave town for a week or so, you can simply keep them a bit cooler (65-70F) and they will be fine with just a bowl of food the day you leave, and a nice big shallow bowl of water, and they will be fine until you get back. If it's in the summer months, you might consider temporarily relocating them to the coolest part of the house, such as the basement. 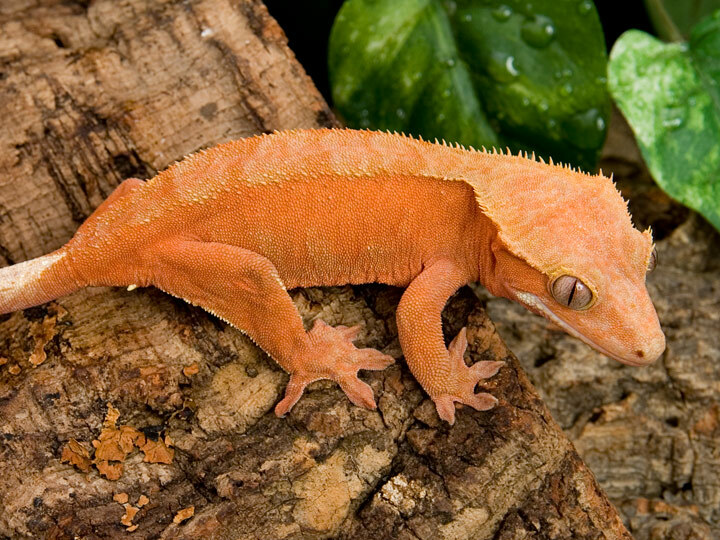 Crested geckos are one of the easiest geckos, if not the easiest gecko species, to handle. Some can be flighty at first, but generally calm down with brief handling periods. A 'hand to hand' walk is generally recommended. In other words, let the gecko jump or walk from one hand to another when handling, rather than trying to restrain or hold the gecko in your hand. Crested geckos are more likely to leap than run, so exercise caution if you're handling your gecko on a hard floor. For younger children, I tend to recommend adults without tails. These geckos are larger, less prone to overheating in the hands of a child and they're typically calmer at that age. Plus, if they've already dropped their tail, you won't have to worry about your child having nightmares about the tail coming off and thrashing around on the floor like it has a life of its own. Aside from the few minor differences mentioned on my gargoyle gecko page, everything on this caresheet can be applied to keeping the crested gecko's cousin, the gargoyle gecko (Rhacodactylus auriculatus).